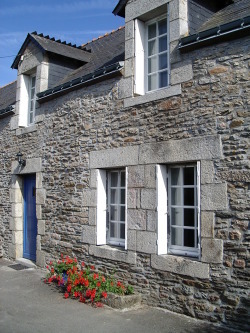 Da Kanaouenn is a delightfully restored 19th Century granite long�re situated in a small hamlet surrounded by farmland. Da Kanaouenn offers 2 g�tes. Kerbihan which sleeps up to 6 people and Kermeur which sleeps up to 8 people. 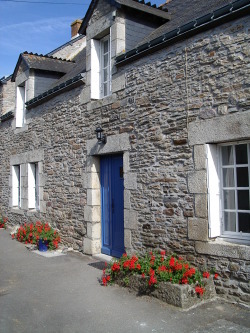 An ideal location for relaxing, walking, cycling or as a base to explore the beautiful countryside, medieval towns or some of Brittany�s spectacular coastline. At Da Kanaouenn your enjoyment and safety are our highest priority. The g�tes were totally renovated during 2004 and newly furnished throughout. The Kitchens are fully equipped and we pride ourselves on the level of cleanliness throughout. The g�tes are fitted with smoke detectors, fire extinguishers and fire blankets to BSI specifications. 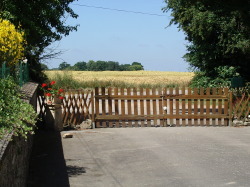 Safety gates are available for both g�tes. We have created a games area in the barn ,with table tennis,a small bar football table and an assortment of boxed games. In addition there is a good selection of paperbacks and a number of reference books on Morbihan and Brittany. There is also a lawned �quiet�area at the front of the property which is ideal for a morning coffee and croissant or glass of wine later in the day! Our local village Reguiny (5 mins) has day to day facilities which includes supermarket, boulangeries, banks, restaurants, bars etc.There is also an outdoor heated swimming pool which is open during the summer months. Locmine, Josselin, Pontivy and Vannes which offer a wider range of facilities and attractions are all within � hour of Da Kanaouenn.. For those interested in bird watching, we are only 45 mins from the bird reserve at S�n� (as featured in Bird Watching Magazine Aug 2004), which has proved very popular with some of our guests this year. You can expect a warm welcome from your French speaking English owners who live on site, and are always available for help and advice. Short and long breaks available including Christmas and New Year. Kerbihan and Kermeur can be booked seperately, but their situation also makes them ideal for booking together for larger groups of up to 14. Specific details shown below on this page. Kerbihan is a spacious property with 3 good size bedrooms which can sleep up to 6 adults and a baby. The g�te was totally renovated during 2004 and newly furnished throughout.Upstairs there are 3 bedrooms, 1 double and 2 twin,a bathroom /shower room and a separate wc. Downstairs there is a second shower room/wc, a spacious lounge featuring original stone fireplace with wood burner, and TV/DVD. The large separate dining room has patio doors opening to the rear garden. The kitchen is fully equipped with gas cooker, washing machine/tumble dryer, fridge/freezer, dishwasher and microwave. The g�te has electric radiators throughout. We have provided a hair-dryer in the double bedroom. Kerbihan is fitted with a smoke detector, fire extinguisher and fire blanket to BSI specifications. A safety gate is also available. Parking is to the side of the property so that the premises are safe for children. To the rear of Kerbihan is a large garden with BBQ and furniture. There is also a covered games area with table tennis & library. We offer an end of stay cleaning option. All linen is provided except for towels. Fresh linen for the 2nd week. Kermeur has 4 good size bedrooms which can sleep up to 8 adults and a baby. The arrangement of the downstairs bedroom with adjacent shower room/wc makes Kermeur ideal for less mobile guests or for 2 couples who appreciate their own facilities. The g�te was totally renovated during 2004 and newly furnished throughout. Upstairs there are 3 bedrooms, 1 double, 2 twin and bathroom/shower/wc. Downstairs there is another double bedroom with patio doors to the rear garden and an adjacent shower room/wc. The spacious lounge/dining room features an original stone fireplace with wood burner and TV/DVD. The kitchen is fully equipped with gas cooker, washing machine/tumble dryer, dishwasher, fridge/freezer and microwave. The g�te has electric radiators throughout. Both double bedrooms have a hair-dryer provided. Kermeur is fitted with a smoke detector, fire extinguisher and fire blanket to BSI specifications. A safety gate is also available. Parking is to the side of the property so that the premises are safe for children. To the rear of Kermeur is a large garden with BBQ and furniture. There is also a covered games area including table tennis & library. All linen is provided except for towels. Fresh linen for 2nd week.